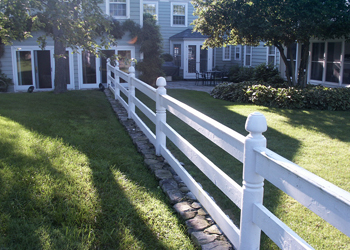 Probably one of the most useful elements in the landscape, fencing not only provides a visual demarcation of property ownership, but it also performs a necessary function of both protection and prevention often required by the law. Swimming pools must be enclosed within fencing according to the codes of most communities, if not all. And, for those who wish to retain the content planted in their cherished gardens, fencing usually keeps invaders at bay. Whether for privacy, decor or utility, fencing is installed with the precision of a perfectionist in every landscape we create.